The Mill Park Hotel offers clients a choice of conference and business room options ranging in sizes suitable for hosting training days, boardroom meetings or private interviews and meetings that will cater from 3 to 30 delegates with our Castle Suite Conference Room Accommodating 350 delegates. Within the North-West region, the Mill Park Hotel is centrally located and equidistant from Sligo, Letterkenny, Enniskillen and Donegal Airport which has scheduled daily flights to Dublin. The Mill Park Hotel is easy to find just off the Donegal Town bypass and with ample free car parking available. A wide choice of dining options in our Granary Restaurant and Café Bar and inclusive Corporate Packages are available from the Mill Park Hotel making it the perfect choice for your business meetings and conference requirements. 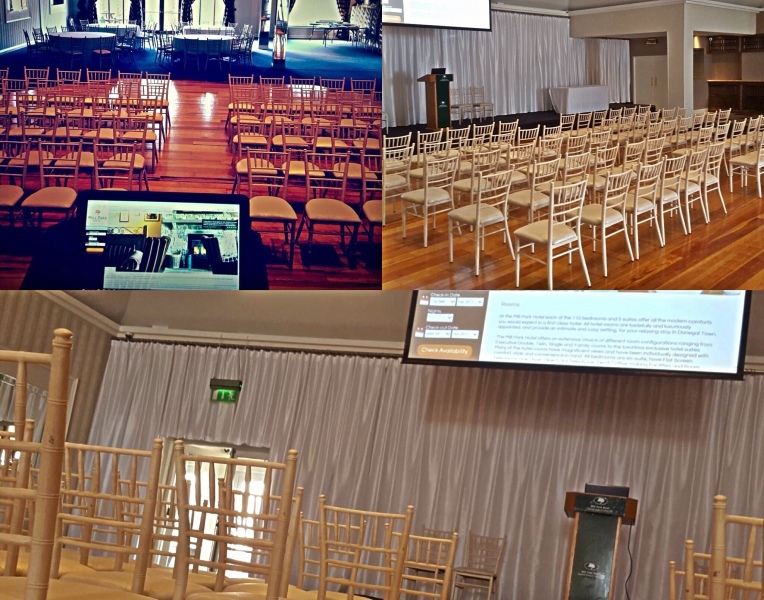 The Castle Suite at the Mill Park Hotel is one of the most impressive conference facilities in north-western Ireland and can cater for 350 guest’s theatre style and smaller groups depending on individual client requirements and room configuration options. Equipped with the most cutting-edge audio-visual equipment, the bright and spacious room is designed to meet varying technical requirements and layouts. Whether it's a meeting or exhibition, a wedding or private occasion, the hotel is committed to providing a professional service, which has earned the hotel its respected reputation. The Conference Suite is beautifully decorated and via its large double doors opens out onto the adjacent garden and patio areas room providing additional space which is ideal for breaks.